Rockwell Software's CPG Suite is built upon the industry proven ProductionCentre Manufacturing Operations Platform (MOP) which couples ERP and plant floor Integration, production execution, data store, analytics and dash board capability. ProductionCentre - Is an enterprise-wide plant information software solution that drives manufacturing excellence. Converting day-to-day operations data into on-demand business knowledge enables unprecedented manufacturing flexibility. Application Server - Supplies application support for all industry specific applications including execution, plant floor & ERP message handling, client access and data storage & retrieval messaging. Database - Each site can contain both a real-time production database for application access as well as an Operational Data Store for report retrieval and querying. Each database provides support for ETL into the dashboard server Datamart for normalizing and KPI Calculation. 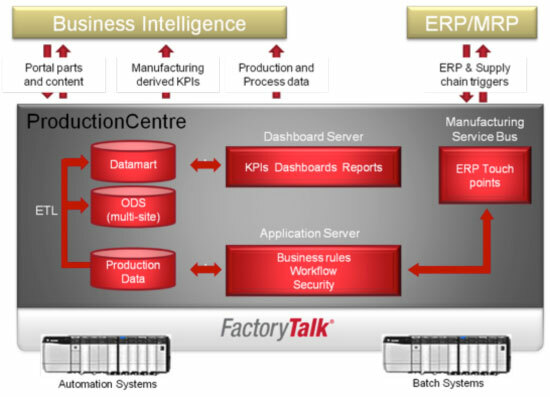 FactoryTalk - The application supports preferred integration with Rockwell Automation's ControlLogix platform using a defined ControlLogix User Defined Data Type (UDT) and is fully compatible woth FactoryTalk services. Each site maintains its own data. Enterprise roll-up maintains site ID data. Reporting at site or enterprise level-or both. Load balancing and clustering support with the application server at each site.